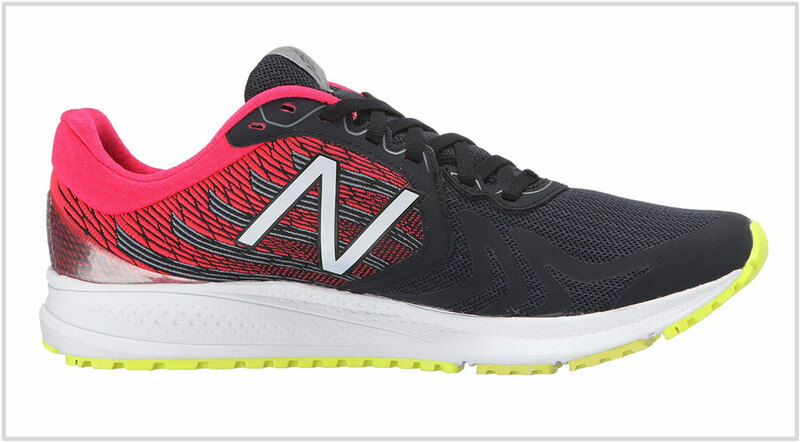 New Balance's marketing pitch: Unleash even more style and speed in the Vazee Pace v2. Upper: Mesh, combination of stitched and no-sew synthetic. Inner sleeve. Midsole: Compression molded EVA foam. 6 mm heel-to-toe offset. 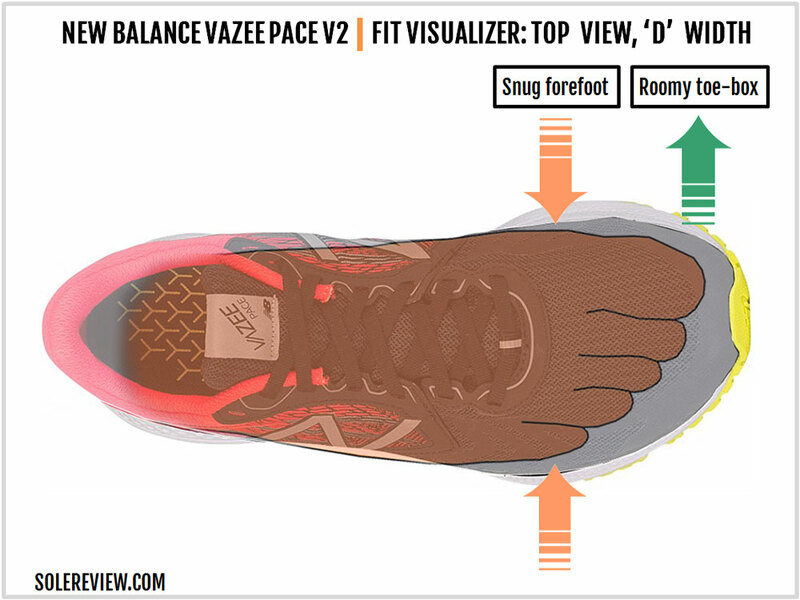 The Vazee Pace v2's ride and fit quality is very similar to the V1. However, the shoe gains a full ounce over the V1 due to its redesigned outsole. Versatile isn’t a word you’d use to describe the Vazee Pace. It has a narrow scope of use; its firm ride only benefits those who want a shoe for their fast workouts or shorter races, and the 6 mm heel offset is far lower than the 10 mm average favored by daily trainers. There’s a good reason why this shoe has the word ‘Pace’ in its name. The Vazee Pace is one of those cross-over shoes which bridge the gap between all-out racing flats and cushioned trainers. The midsole feels firm, but there’s enough foam and rubber to maintain some distance between your foot and the road. The upper, while snug fitting, is a comfortable place to be in. It’s abundantly clear that the Vazee isn’t your everyday walker or trainer. It is purpose-built for runs of a specific kind and is ideally used in a multi-shoe rotation. That’s the impression we got from reviewing the V1 in 2015, and that holds true for the V2 as well. 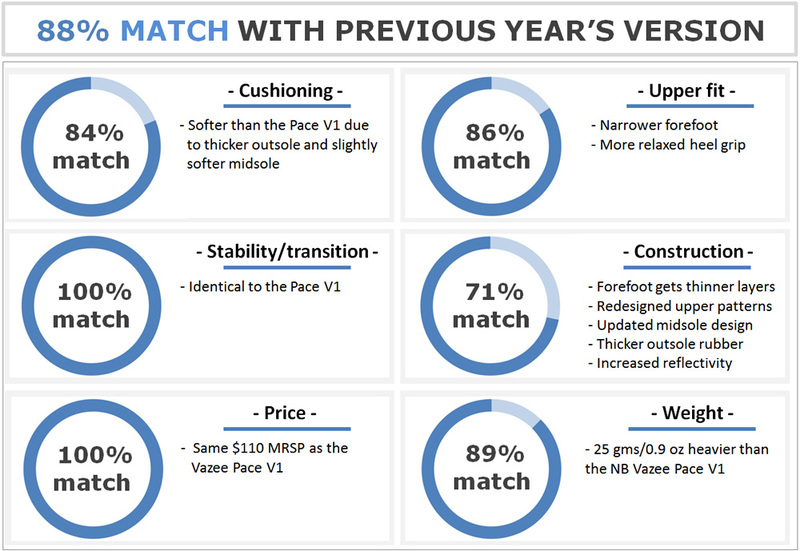 Nonetheless, we’ll warn you upfront that the Vazee Pace V2 has a few changes. To begin with, the V2 is a full ounce heavier than the V1 because of changes made to the outsole. The ride is marginally softer, and the upper fit gets an update too. New Balance’s assortment is getting increasingly cluttered with similar sounding models. Under ideal circumstances, this comparison chart should just contain models from other brands. 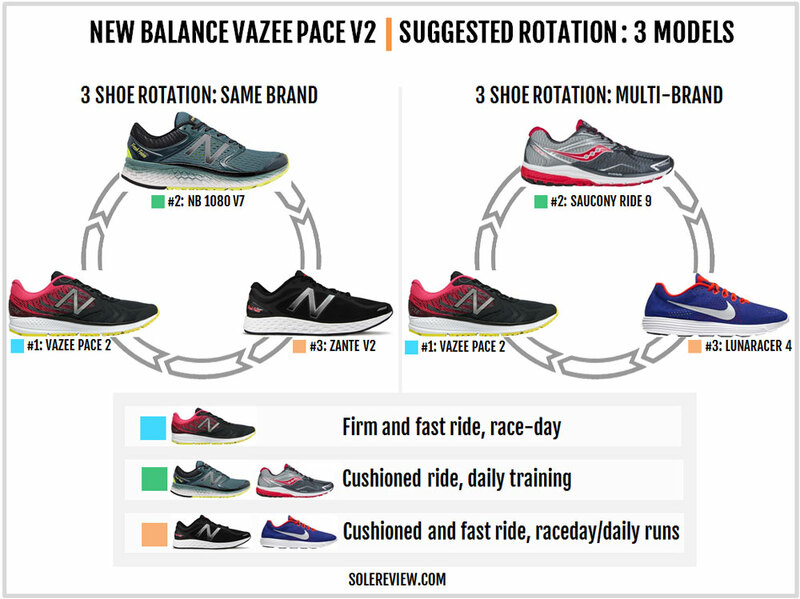 In the Vazee Pace’s case, we’ll have to bring up other New Balance shoes which are somewhat similar in ride and fit quality. At the time of writing this review, there are four different models with the ‘Vazee’ name. Besides the Pace, there’s the Vazee Rush V2, Vazee Prism V2, and the Vazee Coast v2. You can exclude the Coast right away because its (nearly) all-foam outsole makes it far softer and lighter than the Pace. And not to mention the Coast’s knit upper, which fits and feels differently than the rest of the Vazee pack. The closest shoe to the Pace would be the Vazee Rush V2. From a pricing angle, it is $20 cheaper than the $110 Pace, but there are a few things which run common to both. Regardless of the slightly softer ride, the Rush shares a similar midsole and outsole design with the Pace. The upper fits differently, though. The Rush’s one-piece upper has a smoother (and dare we say ‘everyday’?) feel to it. The Prism V2 is a ‘stability’ Vazee, a categorization made plain by the inclusion of a medial post. Its upper fit is nearly identical to the Pace, and the ride quality is similar except for the slightly firmer feel on the inner midsole. The Prism has the ‘Revlite’ EVA foam variant, which is what the Pace uses too. 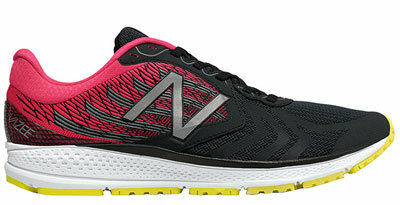 Don’t forget the New Balance 1400V4, a fast racer which is in the same category as the Pace. So what’s the difference, then? The 1400 is slightly softer and has a smoother upper fit. That makes the 1400 more versatile than the focused Vazee Pace. And then you have the usual suspects like the Asics Hyperspeed 7, Brooks Hyperion, Mizuno Hitogami and the Nike Zoom Streak, all of which ride and fit differently than the Pace. The Hyperion and Hitogami are somewhat similar in ride firmness, while the Hyperspeed and Streak happen to be softer. Lastly, if you’d rather prefer a lightweight New Balance shoe with a softer ride (than the Pace), then the Zante V2 is what you should get. The Vazee Pace V2 gets a completely redesigned upper. The last hasn’t changed, but the materials have. The forefoot and toe-box area has a much cleaner design. Instead of the V1’s raised web-like welding and the thick toe-bumper, the V2’s forefoot uses ultra-thin layers. The toe-bumper changes to this material as well. The midfoot receives a few cosmetic niceties. The mid and rearfoot panels are made of a woven material; the pattern appears to be inspired by examples of indigenous textile design. Around the heel, the ridged molded foam is replaced with a glossy synthetic, its transparency revealing the mesh design underneath. The position of the reflectivity moves from the top (on the V1) to the lower part of the heel, thus making the Achilles dip softer. The heel lacks an internal counter, just like the last model. There’s more reflectivity on the Vazee Pace V2. The ‘N’ logos over the midfoot now have low-light visibility, and the tongue carries forward the reflective loop from the V1. Like the V1, the Vazee Pace has a sleeved upper design. The tongue is joined to the upper by a full sleeve; the only difference being that the tongue is longer than the V1. 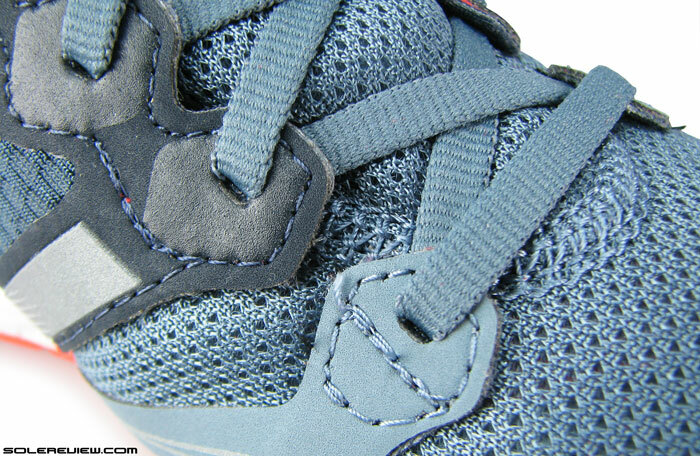 This is a good change; the shorter V1 tongue was a problem when using the last row of heel-lock lacing. A subtle update comes in the form of flat eyelet holes. 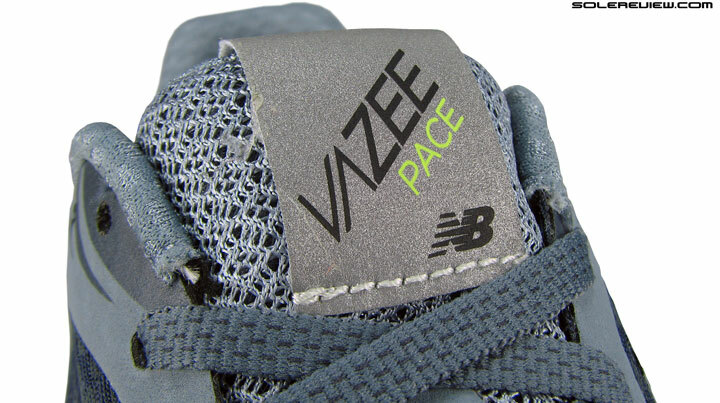 The Vazee Pace V1 had round eyelets, while the V2 comes with flat eyelets which are a better match with the flat laces. It has a functional effect too; the laces pass smoother over the V2. The Pace V2’s lacing eyestay is split into two. The first two rows of lacing are over a separate piece of synthetic; this design is a bit like the Zante V1. And just like the Zante, the new split-eyestay design influences the upper fit – something which we’ll cover during this review. When seen from the top, the removable insole appears identical to the V1. But remember what we said in our Pace V1 review about the insole being slippery? The reverse side of the V1’s insole had a smooth texture which lacked grip over the textile lasting. The V2’s insole features a dimpled texture on its underside, and as a result, the insole stays put over the fabric lasting. This is an improvement over the V1’s sockliner design. The sinewy, sculpted midsole of the V1 is replaced with a golf ball-like sidewall texture on the Vazee Pace V2. The midsole foam has a dotted molding over its side, and the foam is a bit softer than the V1. Both the VZ Pace versions use Revlite, an EVA foam version which is also found on the 1500 V2. Not all Revlite feels the same, though. For example, the 1500’s ride is softer than the Pace. The outsole uses a combination of softer blown rubber (forefoot) and harder compound under the mid and rearfoot. 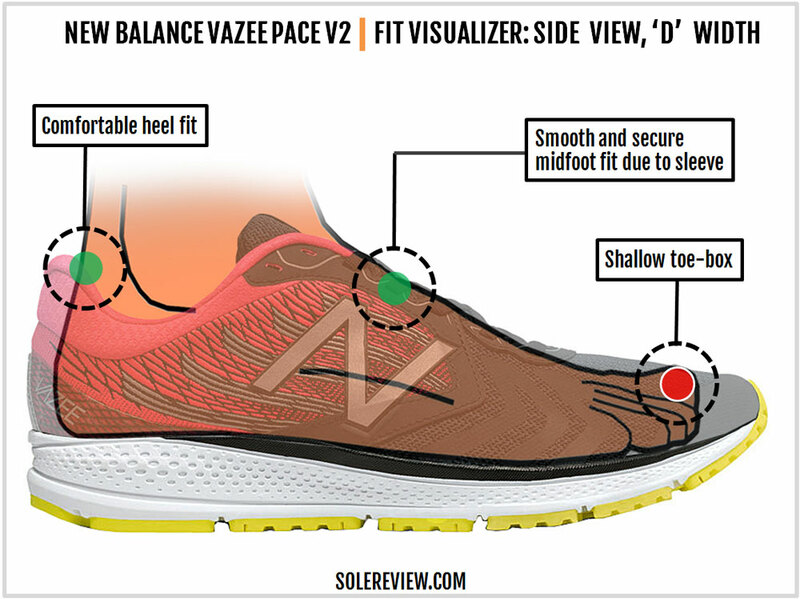 This is similar to the V1’s approach, except that the Vazee Pace’s outsole receives a few tweaks. The V2’s outsole loses the deep flex groove which cut across the V1’s forefoot. Instead, there are two large blown-rubber slabs on either side. 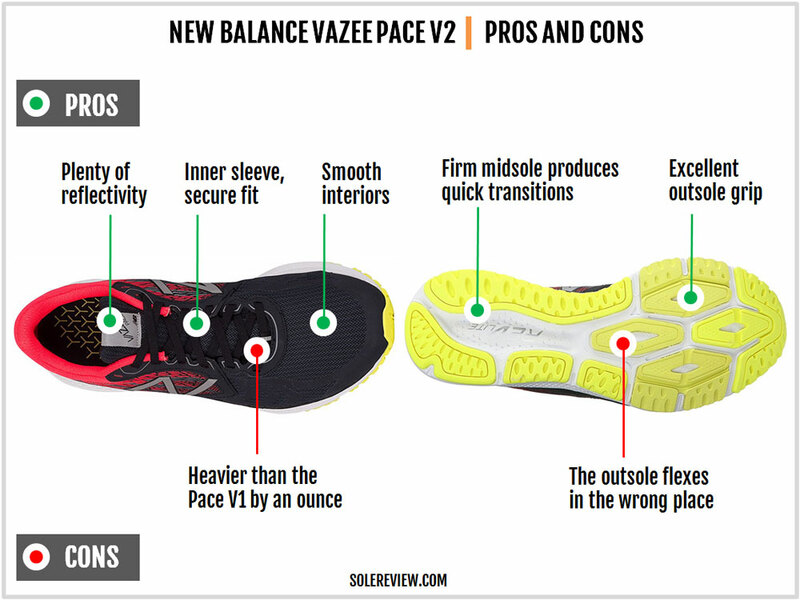 The orientation of the rubber lugs has changed too, an update which affects the Vazee Pace V2’s flexing behavior. If you bent the V1’s forefoot with your hands, the flexing was equally distributed in two zones. One zone was right under the ball of the foot, and the other which was closer to the midfoot. Because of the V2’s redesigned outsole, the flexing point is now focused only near the midfoot. To us, this comes across as an unnatural midsole behavior. There are other changes on the outsole too. The increased coverage and the added thickness of the rubber slabs add more weight to the V2 – a full ounce to be precise. Sample this; our US 11 half pair of V1 weighed a mere 9 ounces. 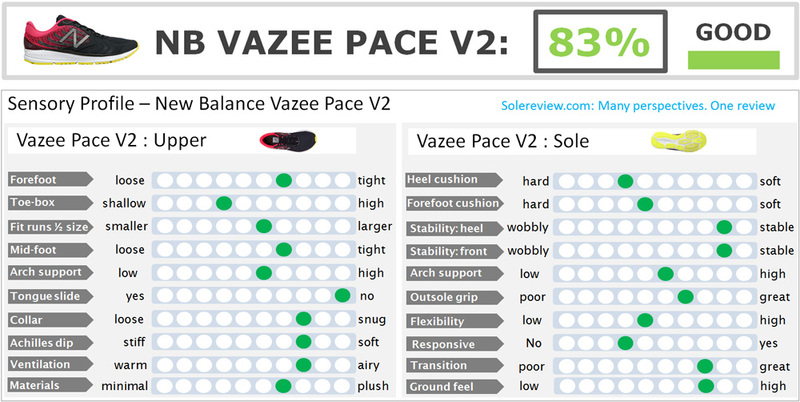 In contrast, a smaller US 9 for the Vazee Pace V2 weighs 9.6 ounces. If you account for the sizing difference, then a US 9 of the Pace V2 is one ounce or 28 grams heavier than the V1. The rearfoot outsole retains the deep transition groove, but splits the outer slab into three pieces instead of two. So the gist is – you have a thicker rubber used for the outsole, which is further split into more pieces. This makes the Vazee Pace V2’s ride a bit softer than the V1. 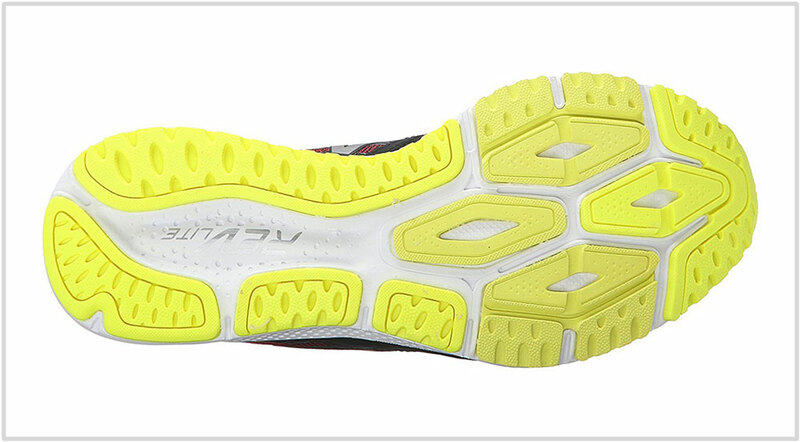 Traction is excellent on the Vazee Pace; the soft rubber compounds grips well over most running surfaces. The Vazee Pace might be a lightweight shoe, but it is far from flimsy. 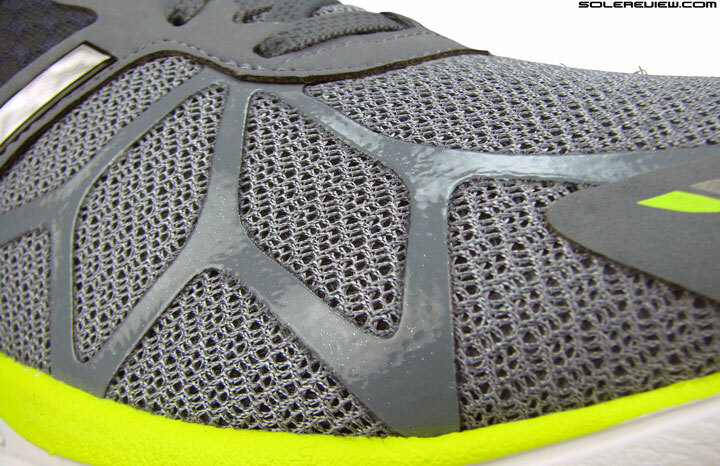 The outsole rubber is thick and durable, so the Vazee will last as long as regular trainers. There have been no durability complaints with the first version, and the V2 will have a similar lifespan. Even the EVA foam midsole will last longer than softer shoes. The firm density makes it resistant to compression as compared to softer EVA foams. 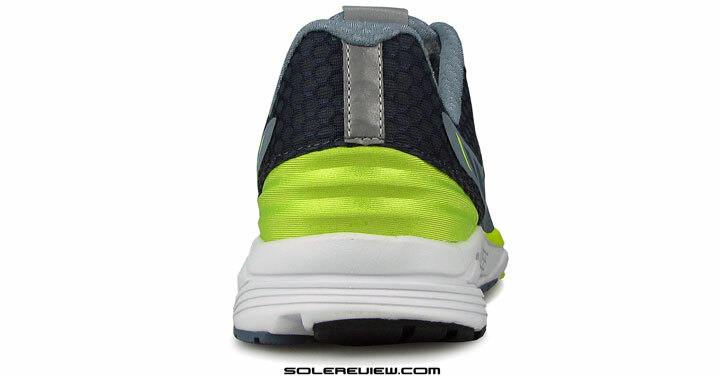 The upper mesh is a closed-type, and there are no hot-spots inside the shoe. A smooth interior prevents friction, which helps averts premature failure of mesh parts. New Balance has one of the best fit templates in the industry, so the Vazee Pace’s well-proportioned interior does not come as a surprise. The spread of space inside the upper is just right; even though the toe-box is a bit vertically challenged, it doesn’t pin your toes to the insole. The reward of an inner sleeve is a smooth midfoot fit, and that’s what the Vazee Pace V2 feels like. The upper material wraps the foot (and the arch) with a uniform spread of pressure. The forefoot feels slightly tighter than the V1, but as it turns out, that’s something you can fix. We cover this in the next section. The upper heel is softer (than the V1) around the Achilles dip. Moving the firm reflective strip to the lower heel makes the top softer than the V1. Both the V1 and V2 hold the ankles in a similar way. You might sense that the V2 has a lower grip because of the softer Achilles dip, but the heel does not slip during runs. 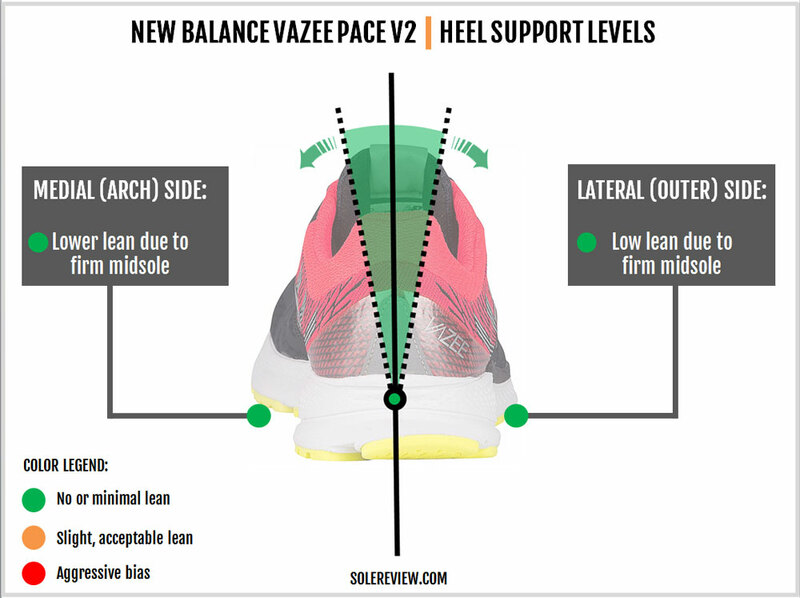 There’s only one thing you need to know about the Vazee Pace v2’s forefoot fit – it is narrower than the V1 because of the split eyestay. 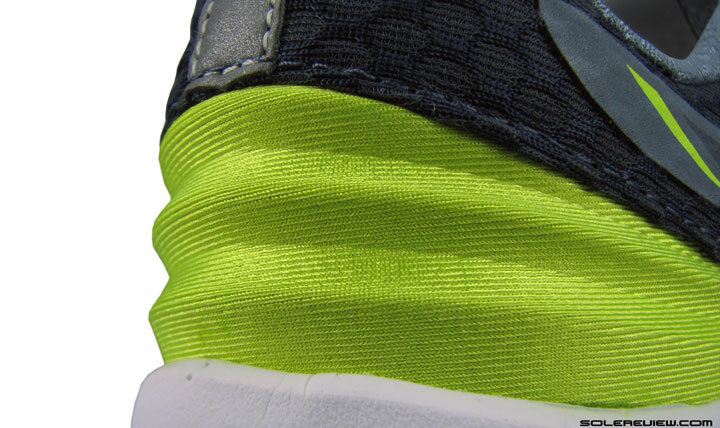 The first two lacing rows are built on a separate piece of synthetic. So when you cinch the laces tight, the first two rows apply pressure independently over the forefoot. So. There are a couple of things one could do. You can either go easy on the lacing pressure around the first two eyelets, or skip lacing the first row altogether. This handy trick not only works on the Pace 2 but on any running shoe. 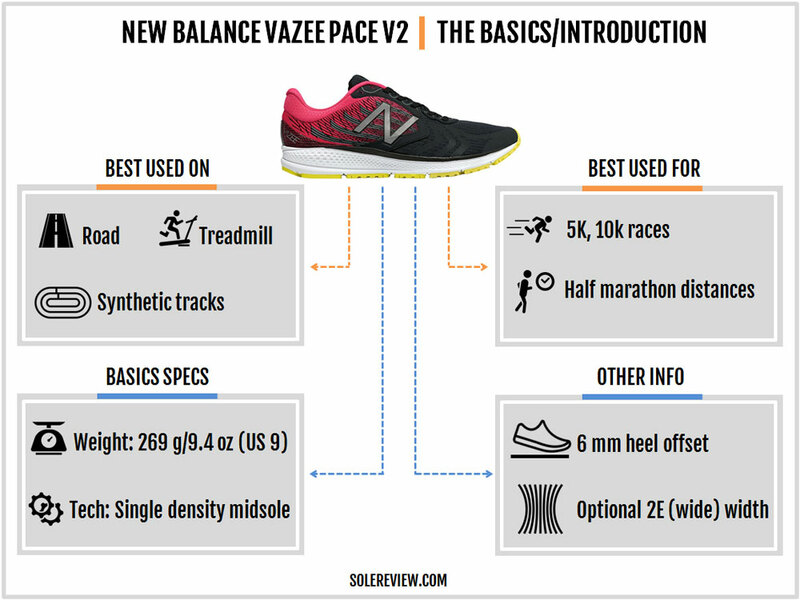 The other option is to simply buy the 2E version of the Vazee Pace if the amount of forefoot space isn’t to your liking. On a comparative scale, the V2’s forefoot and toe-box have a softer feel due to the thinner layers over the mesh. And the sizing runs true to size, as it was on the V1. This is not a soft shoe. Regardless of the minor addition of softness, the Vazee Pace V2 is still a very firm riding shoe. That is why this shoe feels so good on faster runs and relatively uncomfortable while lounging around. As we said, if more softness is what you like, then try the Zante V2 instead. 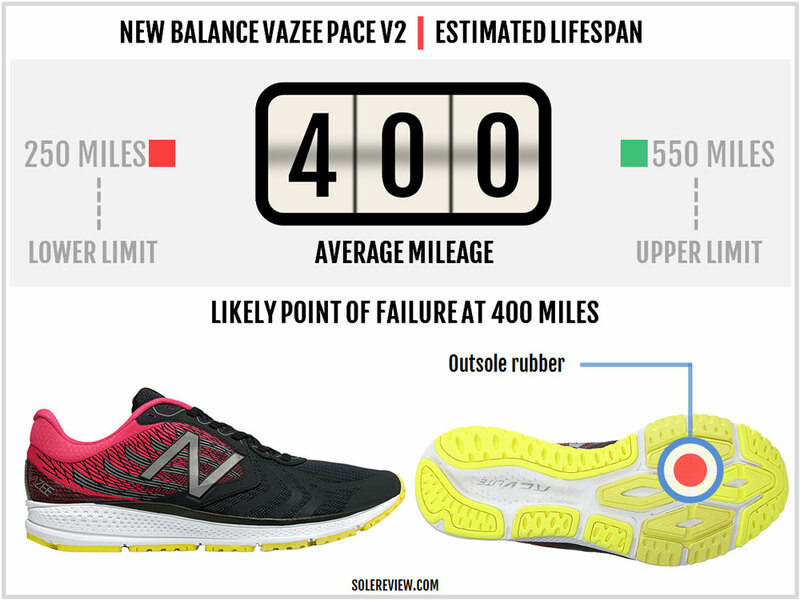 Compared to the V1, the new Vazee Pace runs a bit softer. That’s because of the thicker outsole rubber, and also the way in which the outsole slabs are split into multiple pieces – especially on the outer (lateral) side of the outsole. 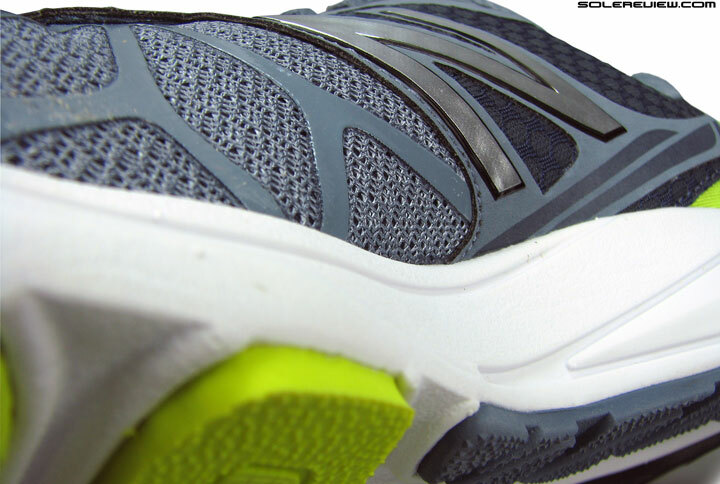 The transition groove under the heel also provides cushioning, as the cavity compresses upon weight loading. But given the amount of cushioning, it is best that you use the Vazee Pace for shorter races of 5k and 10k. A half marathon is also doable, but you might sense fatigue if not accustomed to this level of firmness. There’s another reason why you should limit the Vazee to runs of shorter duration. With a firm foam and a narrow waist, the midsole edge tends to press into your arch. This isn’t a problem when you’re running fast, but if you slow down during a long race, the edges will begin to feel uncomfortable. This was true of the Pace V1 as well. 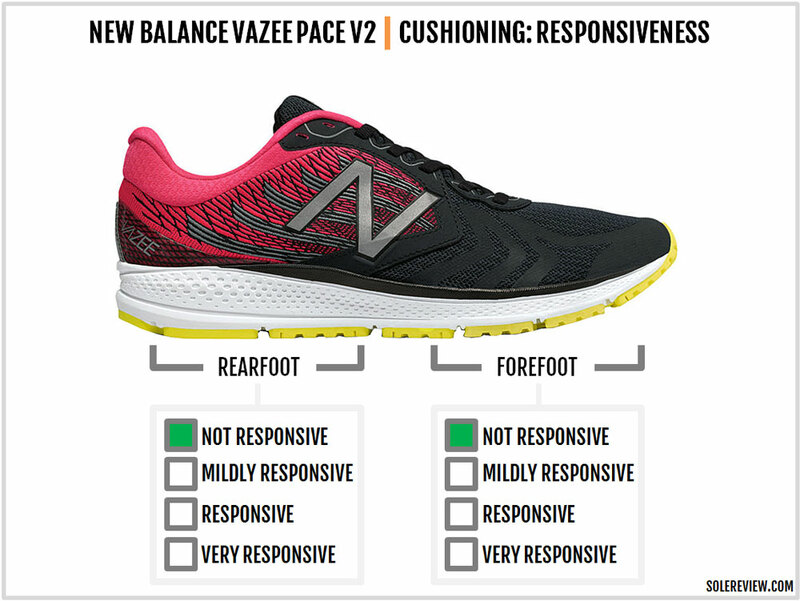 The Vazee Pace’s ride isn’t so much about responsiveness as it is about ground feel. As such, the foam does not have a rebound or spring-back quality; rather, the firm base helps heighten the sense of ground feedback. So no, in the traditional sense of the word, the Vazee Pace isn’t responsive. A better word to describe the ride character would be ‘receptive’; the firmness helps create a better connection with the running surface. Despite the small midsole footprint, the Vazee Pace performs well as a supportive shoe. The firm foam prevents the foot from being tossed around, and the balanced sidewall design creates a stable foundation. Transitions and roll-offs are swift on the Pace; that is helped by the midsole material and the density which are consistent along the length of the shoe. If you bought the Pace to serve as your fast run partner, then there’s plenty to cheer. The firm midsole produces quick transitions, while the volume of foam serves as enough cushioning till a half-marathon distance. The outsole grips superbly and enhances the cushioning experience too. The ride is supportive, and there’s a lot of night-time visibility if after-hours running is your thing. The quality of upper fit is excellent. The inner sleeve combines with the thin external overlays to produce a smooth interior environment, and the sizing fits true. The Pace doesn’t break the bank; at an MSRP of $110, there’s a lot of material and functional value. There are a few things which we don’t like about the Pace. To start with, why is it an ounce heavier than the V1? That kind of difference is a lot when we’re talking about an 8-ounce shoe. We also found the Vazee Pace’s flexing behavior to be downright weird. It flexes near the midfoot instead of under the balls of the foot; the Vazee Pace V1’s flexing was comparatively far more balanced. It is one thing to have an overall stiff forefoot, and another to have the shoe flexing in the wrong place. 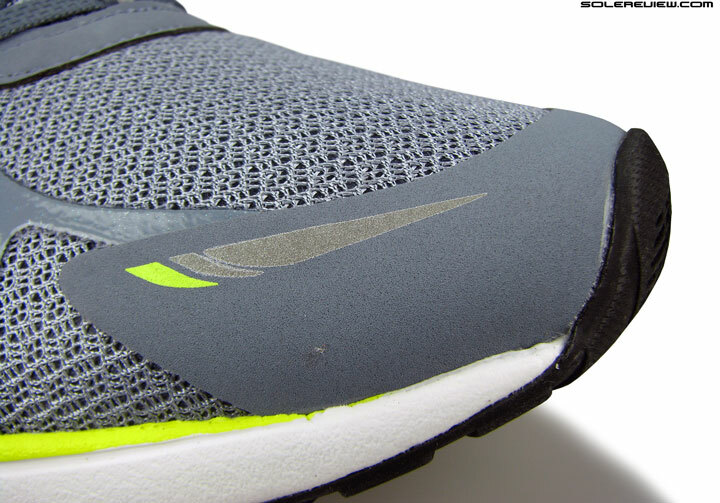 Lastly, the hard midsole edges under the arch get in the way of longer runs. We recommend the Zante v2 to go along with the Vazee Pace and the 1080 V7. One might think the Pace-Vazee combination to be redundant, but we opine otherwise. The Zante has an upper fit and weight similar to the Vazee Pace, but the softer ride is more forgiving. This makes the Zante more versatile; you can do the same things you do with the Pace, and far more – but with increased comfort. The New Balance 1080 V7 has plenty of deep cushioning for long and easy runs, so it makes for the ideal rotational addition. The Saucony Ride 9 pairs up nicely the Pace. The Ride 9 is a cushioned shoe, but far from mushy. Its cushioning is accented with a bit of firmness, a quality which works well for a variety of workouts. The upper fits snug, much like the Vazee. The Nike Lunaracer 4 is perfect for those long, yet fast runs. There’s plenty of cushioning delivered by a soft foam core, and at a mere 6 ounces, the shoe weighs next to nothing. 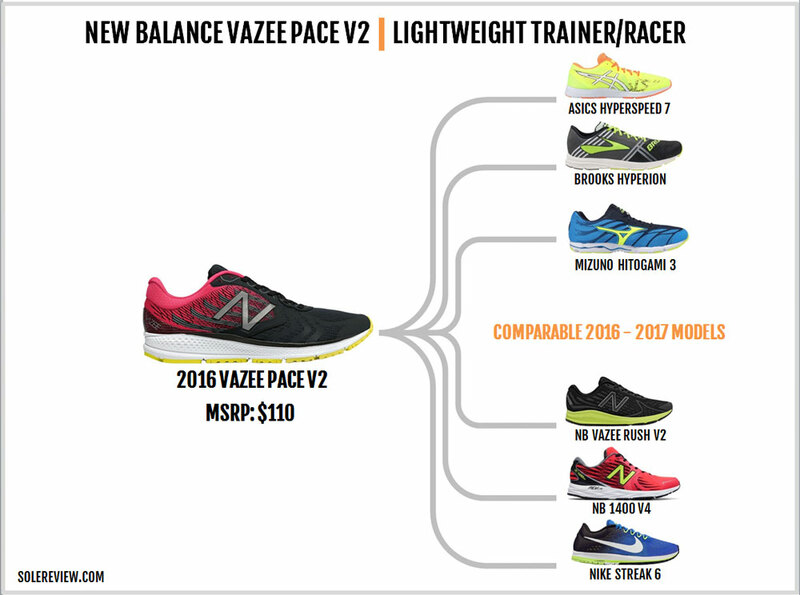 The biggest change is the increased weight; the Vazee Pace V2 packs a full extra ounce of material over the V1. The ride is marginally softer – thanks to the thicker rubber lugs, the splitting of the lateral outsole, and a slight bump-up in foam softness. But in the overall scheme of things, the ride of both the Vazee versions is very similar. There are plenty of other cosmetic and functional changes. The midsole has a brand new sidewall, and the upper gets gorgeous looking woven mesh panels. The level of reflectivity gets an upgrade, as both the ‘N’ logos turn shiny at night. The lacing eyestay is split into two different sections, and that makes the forefoot fit a bit snugger than the V1 – unless you resort to the sizing tricks we mentioned. There are a couple of other tweaks which we appreciate. The tongue is longer than the V1, and the removable insole gets a textured bottom which makes it resistant to sliding inside.